Here are a few more cards for you, these were either made at or inspired from cards from my latest 10 card camp. They range from the simpler to the more time-consuming, but each was fun to make! 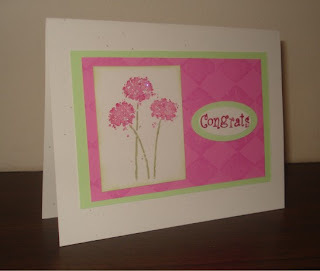 As always, please click on the card to see the details up close). 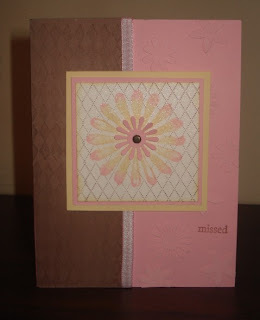 Rock 'n' roll "Petal Prints" with faux dry-embossing & masking. 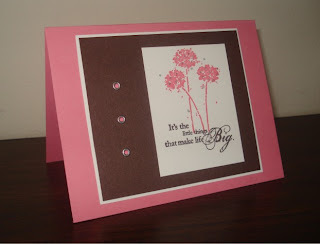 I love the Shimmer paper used here... gives a nice little sparkle. Color Scheme: Pretty in Pink, Chocolate Chip, So Saffron. 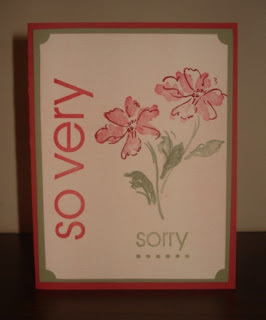 Your cards are beautiful, but I especially love the sympathy card! Ahhhh, spring is in the air!